Are looking for some good reading material to stock up on for the Fall/Winter months? I've got a great place for you check out. It's a new reader's club. 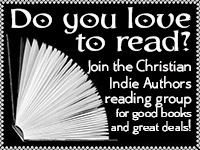 It's called Christian Women Reader's Club and you find it here. They have a verity of books on there from Romance to Suspense. Please take this as your personal invitation to check it out. You won't be sorry! Below is a list of a couple of the author's that have books listed on there right now. Oh, yeah, I almost forgot...some of them are FREE!